Doug Ross @ Journal: WHY DID SHE FEAR FOR HER LIFE? Does Donna Brazile Know Who Killed Seth Rich? WHY DID SHE FEAR FOR HER LIFE? Does Donna Brazile Know Who Killed Seth Rich? The real bombshell lurking in Donna Brazile’s stunning interview with ABC’s George Stephanopoulos about her new book Hacks may be her cryptic references to murdered DNC IT staffer Seth Rich and her statement that she took the precautions one takes when one fears for his or her life. So far, speculation about the unsolved murder of Seth Rich has been dismissed as right-wing conspiracy theories but Brazile’s references to him in the light of all that has come out about Wikileaks, the Fusion GPS dossier, and Hillary’s purchase of the DNC that rigged the primaries against Bernie Sanders, may be a key to a missing piece of this whole puzzle. 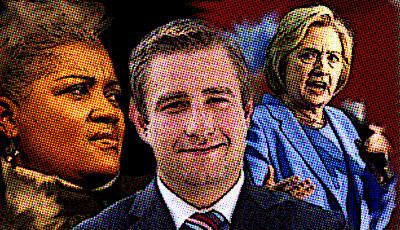 Why did Donna Brazile fear for her life after Seth’s Rich unsolved murder? Were these cryptic references a way of warning those who she feared might do her harm that more would be revealed after her possible demise? Only Donna Brazile can elaborate, and it is doubtful she will at this point. Wikileaks founder Julian Assange denied Thursday that hacked emails from the Democratic National Committee and Hillary Clinton's campaign chairman John Podesta were stolen and passed to his organization by Russian state actors. "Our source is not the Russian government," Assange told "The Sean Hannity Show." "So in other words, let me be clear," Hannity asked, "Russia did not give you the Podesta documents or anything from the DNC?" The Democratic National Committee "rebuffed" a request from the FBI to examine its computer services after it was allegedly hacked by Russia during the 2016 election, a senior law enforcement official told CNN Thursday. "The FBI repeatedly stressed to DNC officials the necessity of obtaining direct access to servers and data, only to be rebuffed until well after the initial compromise had been mitigated," a senior law enforcement official told CNN. Perhaps Donna Brazile knows more about what the DNC was trying to hide from the FBI. Her shocking revelations in her book may be the tip of a rather large and unnerving iceberg. Perhaps Donna Brazile has an idea of who killed Seth Rich and why and that’s why she fears for her life. I have no sympathy for her. She knew too much and remained silent for far too long. Now she wants to avoid dancing with the one who brought her. Her book is a masterpiece of CYA. She's as big a tramp as Hillary. I don't believe a word that P.O.S. says. I don't know why she keeps talking about Seth Rich, unless she is somehow involved, and not in a good way. And as to her complaints about the DNC, she never would have risen as high as she has in that cesspool, if she weren't totally rotten. No sympathy for her, either. Larwyn's Linx: Where's Tony Podesta?